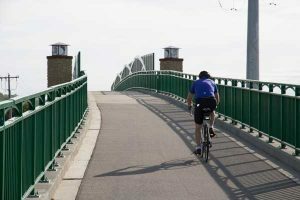 Bike and pedestrian paths are often accommodated as part of our road projects and are increasingly becoming popular as stand-alone projects. These facilities accommodate a mix of users, including bikers, pedestrians, joggers, wheelchairs, baby strollers, inline skaters, etc. Our path designs incorporate many features, including lights, signs, tunnels, bridges, railroad bridge conversion, un-signalized/signalized at-grade crossings, retaining walls, drainage improvements, and landscapes. We pay particular attention to key issues that satisfy the needs of a bike/pedestrian path user and often utilize informational meetings and work with community staff members, utilities, railroads, alderpersons, and neighborhood groups to assure a user-friendly, ADA compliant design. Contact us for more information about our Bike and Pedestrian Facilities Services.